We were driving down the road and some people were cleaning bird nests out of the lettering on the side of their building, you know, the kind that stick out about 6-8 inches, are usually plastic/metal with lighting inside. Aaron remarks on that and wonders if they are going to clean (and this is just how he said it) 'the birds asshome'. At first I heard something else even worse. So, I ask him to clarify. 'You know, birds with a nest in the 's', their 's' home.' Evidently there is a business somewhere on the daily drive to school that has a bird's nest in the letter 's'. Their 'esshome'. So remember parents, don't leap out of your skin next time you hear something that doesn't make sense immediately. And it makes for good bloggin' later. Saw it at cute overload which is really a sickening website after a while. Aptly named. A tip of the hat to you, Mr. Cute Overload guy. Real men of jeeeeeenyuuuuusss..... For women and children only. You know, for kids. Those crazy kids and their non DRM'd inferior formats. According to slashdot, it seems vinyl sales are up. Now all we need is a way to make your OWN vinyl record. I think Wicked Lasers should get started. They can 'burn, slash, melt plastic and when your lighter runs dry, it’ll even light up your smoke'. Ah, convergence! A record making cigarette lighter. If you roll your own Doobie on the backs of the album like some of the slashdot posters. 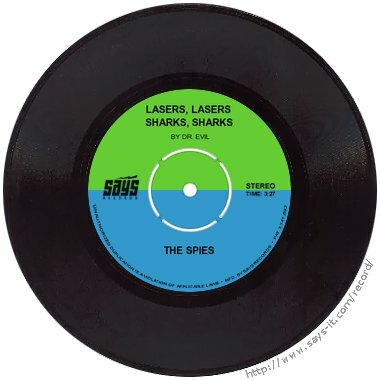 You need something to modulate the signal and power of the laser, and track it on the blank vinyl, but it could be done. This is my idea, so if you build it, I just want a teensy teensy share of the royalties to live on. Nothing too much, just enough to fill a swimming pool with $10's and $20's. But seriously, let's talk. Actually, you can make your own record. These are some of the biggest, most perfect racks you'll ever see. Safe for work. Arr, today's the day, matey! In honor o' this most special day o' days (Talk Like a Pirate Day) here's yer joke, me hearties. Me matey walks into a bar with a steering wheel sticking out of his shorts, and says, "arr, bartender, bring me a flagon of rum!" The bartender says, "sure, pal, but what's with the steering wheel?" The pirate growls, "I don't know, but it's driving me nuts." So far, no one has taken advantage of the offer. 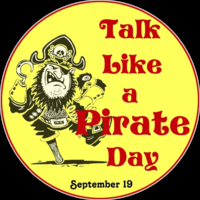 Talk Like a Pirate Day as promoted by Dave Barry.